Buying an air conditioner once considered a sign of luxury, is now becoming quite common in India. Many urban homes are equipped with air conditioners in one or more rooms. But everyone who owns an air conditioner knows that it comes at the cost of increasing electricity bills. Although cooling does take a lot of electricity but taking effective steps can surely get it down. One of the main things that can help is maintaining the right temperature for the air conditioners. For most people, air conditioner just throws cool air at the temperature one sets it at. But does it really work that way? In fact air conditioner during cooling process, takes the indoor air, cools it by passing it through evaporator coil and throws it back in the room. It is quite opposite to how our good old air coolers used to work. Air coolers used to take outside air, cool it with water and throw it in. But air conditioners just work on internal air. If you set the thermostat at 18oC (64.5oF), does it mean that the air conditioner will cool the room faster than if set at 25oC (77oF)? No. The thermostat just checks the temperature of the air inside the room and stops the compressor when the temperature reaches the desired level. This means that the compressor will work longer if the temperature is set to a lower level, i.e it will work more and use more electricity if temperature is set to 18oC (64.5oF) than if it is set to 25oC (77oF). This is because it will take less time for air to reach to 25oC (77oF) than 18oC (64.5oF) as the compressor is working with the same power or wattage. What happens when the compressor stops? The air conditioner just blows the fan when the compressor stops and thermostat reaches the desired temperature level. At this stage the electricity consumption is only for the fan which is running and not for the compressor. The compressor will start again when the thermostat detects that the temperature has increased again from the levels that are set. Compressor is the most electricity consuming component of an air conditioner. 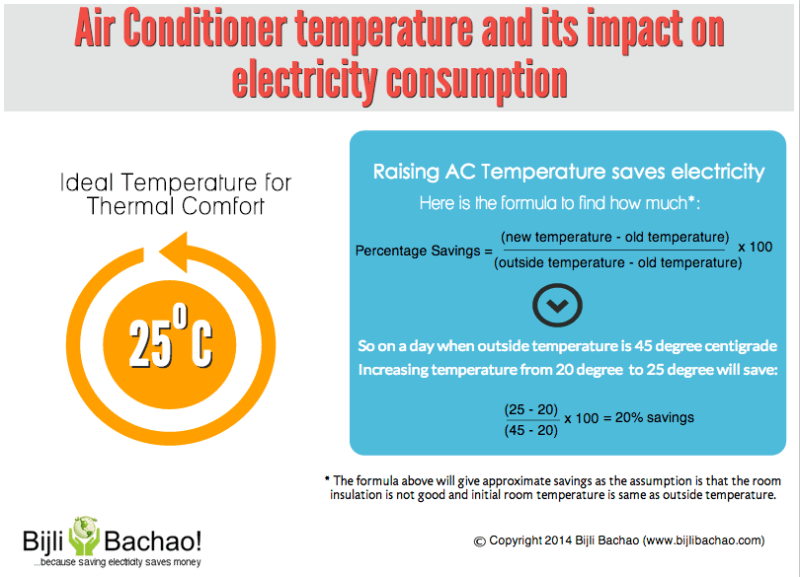 What factors impacts electricity consumption of Air Conditioner? 4) Temperature setting of the air conditioner. If the difference between temperature desired and indoor/outdoor temperature is huge, then the air conditioner will need lot more electricity to cool the indoor air to desired temperature as the compressor will run for longer duration. If the temperature is set at 18oC (64.5oF) and the outdoor temperature is 38oC (100oF) then the electricity required will be lot more than when thermostat temperature is 24oC (75oF) and outdoor temperature is 38oC (100oF). As per study by ACEEE (American Council of Energy Efficiency Economy), increase of each oC can save 3-5% of units consumed. This can considerably bring down the units consumed per month in the electricity bill. What is the ideal temperature that should be set on thermostat? Having said that, increase in temperature does not reduce the comfort level. In fact as per ASHRAE (American Society of Heating, Refrigerating and Air-Conditioning Engineers), the ideal temperature for thermal comfort is between 23.5oC (74.3oF) and 25.5oC (78oF) in summers (depends on several factors as listed on wikipedia). Thus setting the temperature to 24oC (75.2oF) saves on electricity bill and provides good comfort. Using ceiling fans along with air conditioners can additionally help in increasing the thermostat temperature. Does “Quick Cool” option in Air Conditioners help? Setting an air conditioner to quick cool sets it’s temperature to 18 or 16 oC (64.4oF or 60.8oF) . This means that the compressor stops only when indoor temperature reaches this level. But while coming down from 35 or 40 oC (95oF or 104oF) it would have surely crossed 24oC (75.2oF) which is a comfortable temperature. So using “Quick Cool” option does not help because more electricity is used to get the temperature down to 18oC (64.5oF) whereas compressor would have stopped in between if the temperature was set to 24oC (75.2oF) thereby consuming less electricity. How do old air conditioners without thermostat work? Old air conditioners without thermostat have high, medium and low cool options. As we learnt earlier that compressors of air conditioners work in binary mode (either they are on or off), an air conditioner without thermostat does not control air temperature. The high, medium and low options just changes the air conditioner fan speed. High means that air conditioner will throw more air and low means that the fan speed will be slow.